People say that you’re not supposed to play with your food. But the adventurous little elephant in Don’t Feed the Elephant never got the message! Join him as he dances around with a cotton-candy wig, spins donuts on his tusks, and makes himself an ice-cream-cone hat! 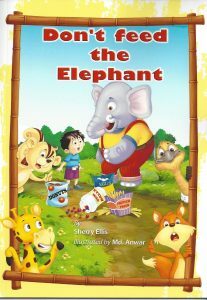 The tale of this elephant and his love of food won’t just delight you with its silly antics and hilarious situations. It will also teach your children about the letters of the alphabet. From animal crackers to zebra cakes, this elephant is keen to try foods starting with every letter of the alphabet, even if it lands him in hot water. I wanted to create an alphabet book. The idea to have an elephant eating a bunch of different foods beginning with every letter of the alphabet popped into my head. It was fun imagining what an elephant would do with all the food! The elephant was the result of a creative spark. I made him as silly as possible. The other characters in the illustrations were a collaboration between the illustrator and me. If you happen to meet an elephant, and he asks for a snack, tell him, NO!" He'll want animal crackers, brownies, and a bag of cotton candy. He'll beg and plead and say, "Pretty please with sugar on top!" But don't do it. Oh, no, don't you do it. Sherry Ellis is an award-winning author and professional musician who plays and teaches the violin, viola, and piano. When she is not writing or engaged in musical activities, she can be found doing household chores, hiking, or exploring the world. Ellis has previously published Bubba and Squirt's Big Dig to China, Ten Zany Birds, That Mama is a Grouch, and That Baby Woke Me Up, AGAIN. Ellis, her husband, and their two children live in Atlanta, Georgia.